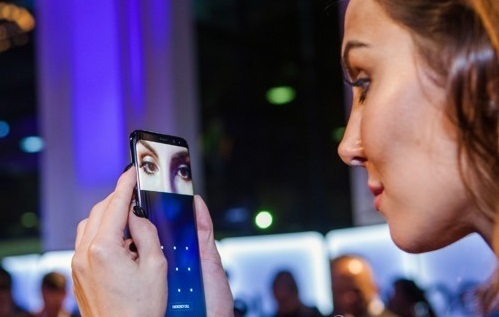 South Korea's credit card companies are seeking to apply the iris scanner adopted by Samsung Electronics Co.'s Galaxy S8 smartphones on mobile transactions, industry sources said Friday, lauding the feature's security compared with fingerprints and passwords. According to the sources, Samsung Card Co. is seeking to apply the iris scanner on its mobile application, allowing users to make financial transactions through the feature. Officially released in South Korea and in parts of North America, the Galaxy S8 allows users to unlock their devices simply by staring at their front screen. Compared with the previous security features based on passwords and fingerprints, industry watchers said the update makes it virtually impossible for another person to unlock the devices. While the iris scanner was also adopted by the ill-fated Galaxy Note 7, local financial firms then only applied the technology for logging into accounts but not to verify transactions.